This FAQ is a guide for parents purchasing courses for their students. Schools, please visit: Apex Learning. How do Course Credit and Accreditations work? Will students get credit from their local school for individual courses taken via ALVS? Yes. In the past five years, every school student who passed one of our courses received a school credit! As online learning has become more widespread and accepted, schools have become increasingly open to accepting credits, particularly from online schools such as ALVS which is nationally accredited and NCAA, AdvancEd and College Board® approved. Call your local school counselor if you want to confirm your student’s eligibility for credit directly with his or her local school or, if it’s easier feel free to use this ALVS Credit form. AdvancEd – We are committed to high standards, academic excellence, and success for all students. Since 1999, ALVS has been accredited by AdvancEd. This certificate of accreditation recognizes ALVS for promoting and maintaining a well-balanced educational program and for exceeding standards considered essential for quality education. UC – The University of California (UC) has certified ALVS standards-based courses in “a-g” instructional areas to fully prepare students for first-year university programs. NCAA – ALVS courses and our instruction model have been approved by the National Collegiate Athletic Association (NCAA) as meeting the requirements for the initial-eligibility certification status for high school student-athletes wishing to compete in college. Please click on this link to see the list of our 80+ NCAA eligible courses. College Board – ALVS was one of the first online high schools to be approved by the College Board® for our AP® curriculum. Click on this link to see the list of our 13 AP courses. Can students earn a diploma at ALVS? Yes. ALVS is a fully accredited private high school. Students can earn a college preparatory diploma through the full-time program. Details can be found here. How long does it take to get answers if students have questions? ALVS students receive real-time access to teachers and tutors through online chat as part of the cost of their course. Live Tutor Chat is available Monday through Friday, 5 a.m. – 5 p.m. Pacific Time. In addition, your Teacher will respond to questions asked using our message center within 1 business day and return assignments with grades and feedback within 3 business days. Can parents and guardians receive progress reports for a student’s course? A weekly progress report is emailed to designated adults once a week for the duration of the course. Designated adults–we call them ‘coaches’–can be parents, guardians, local school staff, tutors, or mentors. The coach can use the report to help their student stay on track and motivated. ALVS research shows that adult engagement is a key indicator of success for online students. Individual courses cost $350 per semester. Materials (if required) are additional. 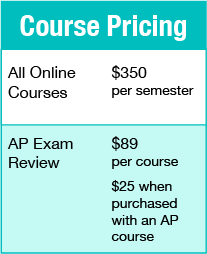 AP Exam Review is $89 per course, or $25 when purchased with an AP course. Do students need to purchase textbooks? Required or optional materials are listed by course in the online catalog. If required, “Course Materials” will appear under “Course Syllabus” on the course description page. These materials can be purchased at any retail establishment. How do students know what courses to take? Students can talk to their guidance counselor at their school to find out what courses are needed to meet graduation requirements. Students enrolled in the ALVS Full Time program will receive guidance from our Head Counselor on their course schedule. The syllabus for each course can be found in the course catalog. Do you have University of California approved courses? To enroll, click the Enroll Now button at the upper right-hand corner of this screen. Choose a course, add it to the shopping cart, and continue with the checkout process. You will receive an email with instructions after your registration is received. Students or parents can also call ALVS at 1-855-550-2547 and speak to support or one of our counselors. When can students start the courses? You can start our courses any time. A fall or spring semester lasts up to 18 weeks. During the summer term (May – July), the semester course duration is accelerated, usually nine weeks. Students are always welcome to work ahead. Can students accelerate and finish courses faster? Yes, with 24/7 access to the learning platform, students are able to work at their own pace. They can work ahead of schedule and are not held back by the assignment calendar. Deadlines and due dates for assignments and tests are there to keep students on track. ALVS provides students with the tools to complete their course on time and with the best chance of academic success. Are courses different during the summer term? Courses from our catalog are available year-round, and the course content is the same for summer school. Typically, the summer term course duration is nine weeks; however, the standard 18-week duration is available upon request. What is the course structure like? The amount of time students will spend varies by course. The time commitment is similar to what a student might spend in class at a local high school. See specific information here: Pathways. With 24/7 access to the learning platform, students are able to work at their own pace. They can work ahead of schedule and are not held back by the assignment calendar. Deadlines and due dates for assignments are recommended to help keep students on track. Students complete courses through an online learning platform, where they work at their own pace toward scheduled due dates. A virtual teacher assigned to each student facilitates the course. Students engage and interact with multimedia content, practice skills, and check their understanding through ongoing assessments. Each course contains computer-scored and teacher-scored activities and tests that are submitted electronically. Students have 24/7 access to the course content and are not required to be online at a specific time, unless they wish to meet with their online teacher via phone or video chat. Plus, students can chat with online tutors in real-time as part of the cost of the course. Live Tutor Chat is available Monday through Friday, 5 a.m. – 5 p.m. Pacific Time. Will students have a live teacher? Yes. With an average of 21 years of teaching experience — seven of those years online — Apex Learning Virtual School teachers provide individualized expertise and engagement students can rely on. Teachers monitor each student’s progress to ensure the understanding of concepts, and continually guide students to improve important problem-solving and communication skills.